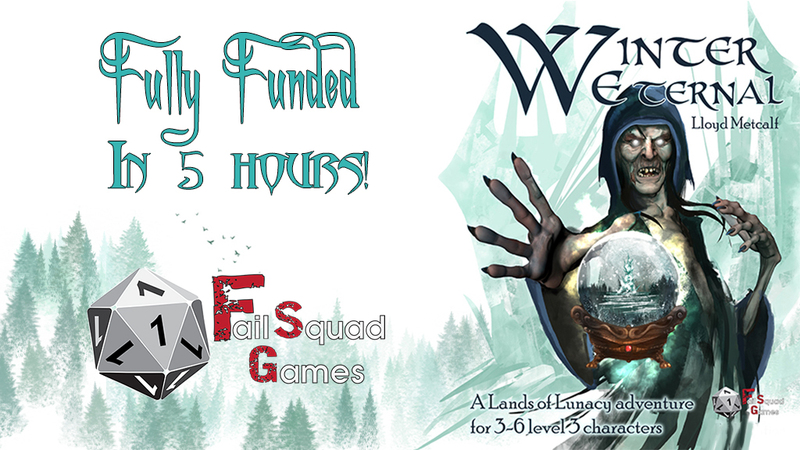 Went live, and immediately funded just a few hours into launch! It has now exceeded 200% of the mark and is growing. This was a quick running project for a single session module that may be driopped in the MIDDLE of your current adventure for level 3 players! It is the first official module for Lands of Lunacy and the clock is ticking! Have no fear, there are bundles where you can get your copy WITH the Winter Eternal adventure if you need one. This adventure puts the cleric (Or divine character) in the driver’s seat. While not necessary, it is more fun with a cleric! This is going out as a FULL COLOR adventure module on premium paper! yeah, you want this at your table. Back it now!! This is a short run Kickstarter, it won’t last long! and you can get it for a Fiver! ← Dungeon Mastering like a MASTER!